My BBC Dessert tonight was fantastic and it only takes about 2 minutes or less to make. Simply preheat a nonstick “dry” (no oil or water) pan over medium heat. Add your banana that is sliced in half vertically and cook until blackened. 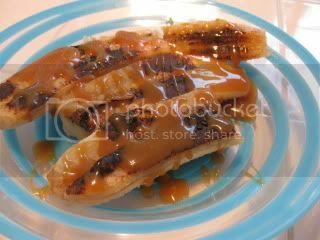 While your banana cooks, heat 1 Tbsp of your favorite caramel sauce in the microwave for 10 seconds. Remove your banana and top with caramel. This entire dessert is only 3 Weight Watchers Points – yahoo! I actually debated licking the plate. 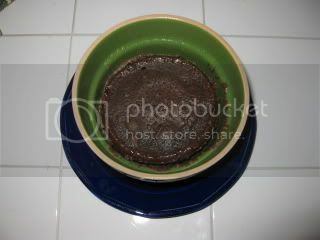 The Husband tested out the 3 Minute Chocolate Mug Cake that I made for him today. 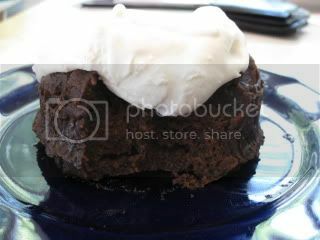 Topped with some whipped cream that was left over from my guest post recipe! The verdict ~ he liked it! I did try a small bite and it reminded me of a dark chocolate vitatop but with the density of a brownie/cake almost. I cooked it in a bowl instead of a cup because I didn’t want it ot overflow. It was fun to make a cake in 4 minutes flat! * Emily is having another MixIt Granola Giveaway ~ click HERE to check it out. * C.G. Foodie is having a Goddes Giveaway ~ click HERE to check it out. And last but not least, today is your last chance to enter to win a FREE Copy of the Bikinig Bootcamp Book. Click HERE for the details. « I "Cut Class" & I liked it! Those desserts look amazing!! I really want to try the bananas, they look heavenly. Glad the quick cake worked out, too 🙂 But I'm still drooling over those bananas! ahhh what delish desserts =)! glad the hubby liked that cake- though i don't know how he couldn't.. i mean, look at it! Your bananas came out beautifully! Billy and I both decided that even just a WARM banana is a yummy treat on its own…so good. I was kind of hankering to put peanut butter on mine! I'll bet your chocolate cake is cheaper than Vitatops!! Sounds delicious! that banana business is bangin! yummm. i would have licked the plate. just sayin! and the choc cake looks better than i even imagined! i for sure need to whip it up. so simple. i bet i could add some protein powder to it too, i used to make something similar in the microwave ("protein brownie") but it was a little stale, this looks really moist! Anne ~ The banana dessert was seriously amazing – I am definitely having that ALL over again. Jenny ~ Yup – it's good – you NEED to try one – only 4 minutes total from start to finish….add peanut butter to it and YUM! Angelea ~ ohhhh peanut butter or almond butter would have been a fantastic addition. Janetha ~ You can put caramel on anything and I'd probably lick the plate too. 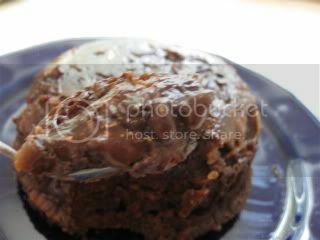 The cake was so easy to make and I think better when eaten warm all chocolately, melty and soft. Wow, I must try that banana dessert – it looks incredible! And it doesn't stick to the pan? Fatfighter ~ I used a nonstick pan and the banana came right out. I wonder how it would turn out with nonstick spray – maybe crispy? Hmmmm…it would be worth a try!